The handle shape and short blade length of these unique carving tools make them the perfect "gap fillers" between conventional palm handled and full sized carving tools. The 4-1/2" handles are designed to be held like a pencil for precise control. When more force is needed place the flared handle end in the palm of your hand. Tools have 1-1/4" laminated steel blades. 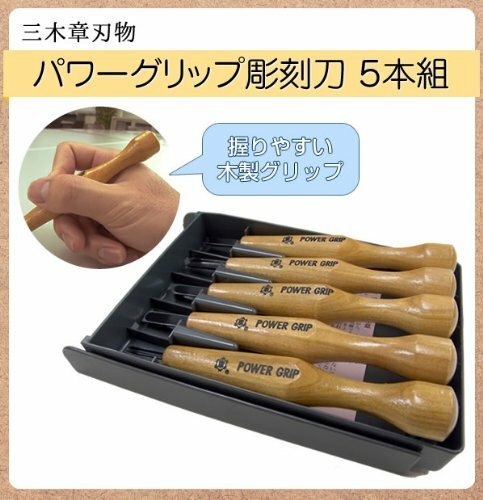 The set contains a 3mm #9 gouge, 6mm #8 gouge, 7.5mm skew chisel, 7.5mm straight chisel, and 4.5mm v-parting tool. A storage box is included.